Metal bands invariably register in the public mind as loud, fast and mighty, but in recent years everything in the metal world has been delightfully up in the air. The stoner metal movement has slowed tempos down enormously, and it's not uncommon to see a metal band play as quietly as possible. The next logical question: Can metal also be played by just one person? 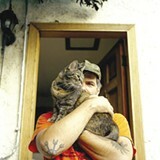 Thrones is the solo project of Joe Preston (above, with kitty), who as a member of the Melvins played a high-profile role in the early reshaping of metal. He's also been a sometime member of just about every "it" band of the last 10 years, including Earth and Sunn o))); he'd be the perfect go-to guy to score a documentary about the cleanup of Boston's great molasses flood of 1919: a lot of slow-moving activity, a lot of horrific destruction. Preston is a big name in metal circles, but he prefers appearing in undiscovered, out-of-the-way locales, "where people are more appreciative of your effort to do something at all," he says, "than your skill at aping a particular style." On Thrones' current tour, this philosophy goes to the extreme, with actual dates booked at an abandoned train station and a ghost-town smog shop and, on a lesser note, the Forestville Club. This, it must be noted, is thrilling news for Forestville's three metal fans. Preston represents the Pacific Northwest, but he appears with two other solo acts, both from Southern California: Bobb Bruno, who wears a bunny outfit, surrounds himself with stuffed animals and plays electronic drum pads with satanic metal riffs (must-see video of the week: Bruno, bunny outfit and all, being serenaded onstage by Fiona Apple singing "Tonight You Belong to Me"); and David Scott Stone, who plays experimental solo synthesizer. The excellent and off-kilter Petaluma duo Moggs open the show on Wednesday, Nov. 7, at the Forestville Club, 6250 Front St., Forestville. 9pm. Five measly bucks. 707.887.2594.